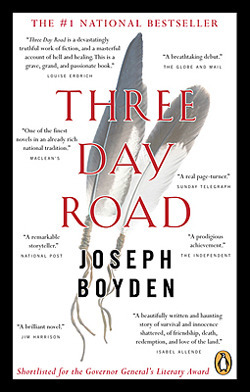 Joseph Boyden’s, , is a wrenching historical novel of the day-to-day lives of two young First Nation Cree men who experience the atrocities of the Great War. Xavier Bird and Elijah Whiskeyjack have honed from a young age their hunting skills in the Canadian woods. Their sharpshooting ability makes them standout from the other infantrymen and they soon become expert snipers. Xavier, although the better marksman of the two, prefers to be the silent observer and spots the German targets for his partner. Elijah, on the other hand, revels in the kill, and soon loses touch with reality. Xavier, grandson of a beloved Cree healer and Windigo killer, is torn between the love and loyalty he has for Elijah, and the need to stop his gratuitous killing sprees. Woven into their lives is the story of the medicine woman, Niska, Xavier’s Auntie who has kidnapped him at a young age from the grasp of the Residential School to live on the land with her. She represents the dying Cree culture and must help Xavier heal from the horrors of war, and the ravages of his morphine addiction so he can help his people continue on. This is a tremendously riveting read, not an easy one considering all the realistic and violent images of war, but one that will stay firmly with you.